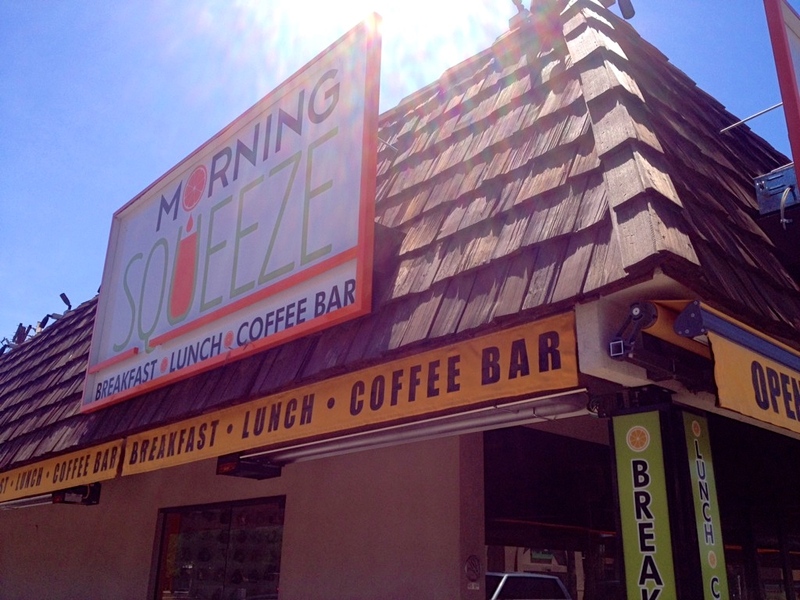 My best way to describe Morning Squeeze is bright, bold decor (lime green and surfer-blue colors), booths and barstools and a very large dog-friendly patio area. 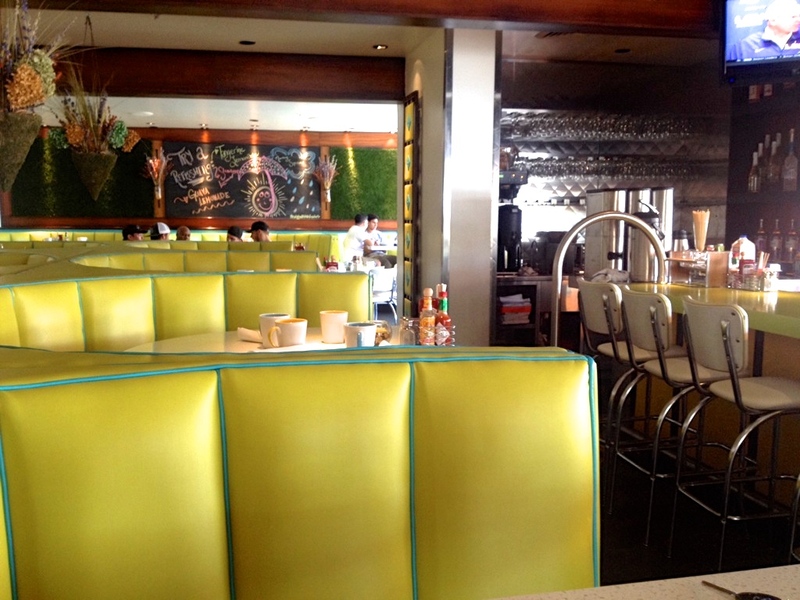 This location is in Scottsdale and owned by the same owner as another Valley favorite RA Sushi. Some of the breakfast items (with some fun names) include the Belfer Fit Bowl (a brown rice, quinoa and egg white bowl), Cool Beans Rancheros, Party Hardy Steak & Eggs, Creme Brûlée Pancakes, Power Protein Pancakes and several Antioxidant bowls. I came here with a friend on a quiet day and received pretty good service. 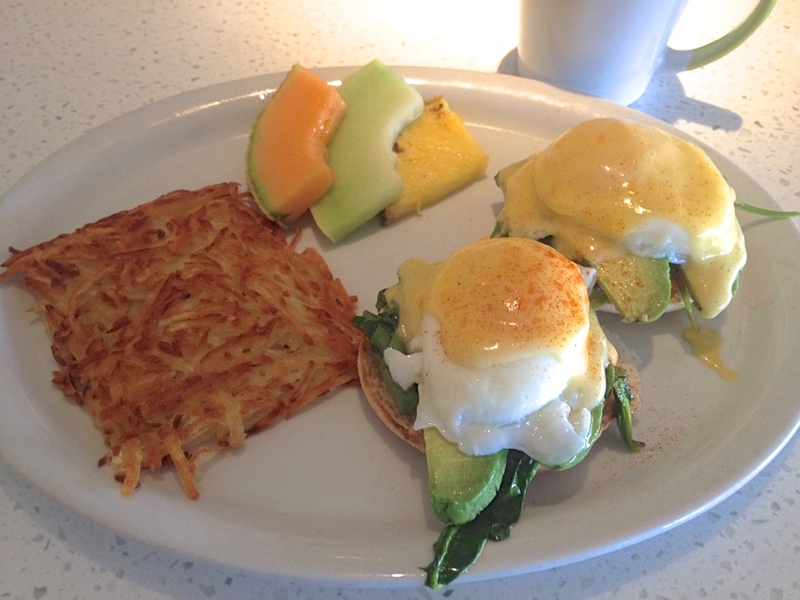 I ordered the Cali Benne (Poached eggs with avocado slices, spinach, tomatoes, on an english muffin with hollandaise). The food was delicious and we had a nice time here. This entry was posted in Breakfast Food and tagged 70's, Antioxidant bowls, avocado, barstools, Belfer, breakfast, bright decor, Cali, Cali Bennie, Cool Beans Rancheros, Creme brûlée pancakes, dog friendly, egg whites, eggs benedict, FoodArtandCulture, hollandaise, lime green, Morning Squeeze, Old town Scottsdale, Party Hardy Steak and Eggs, Patio, poached eggs, power protein pancakes, quinoa, RA Sushi, retro, Scottsdale, spinach, surfer, Todd Belfer, Zomato by ttimmons. Bookmark the permalink.